As one of the largest PC manufacturers, HP is a leader when it comes to large scale production. HP had a late entry into the mobile market, with Palm’s WebOS operating system, but after divesting themselves of this past, they’ve jumped into Android with both feet, producing a range of Android tablets in quick succession, and even moved into phones in some markets. As a market leader in the PC industry, the tablet and mobile phone market is obviously only the start for HP. HP has previously played with Android on various form-factors, releasing the HP Slate 21 earlier this year and then following up with an announcement in April of an Android based laptop – the Slatebook 14. Android laptops have been around for a long time, they’ve so far been fairly low-end affairs from Chinese manufacturers and generally been sans Play Store. This time around, Google has seemingly blessing the Slatebook 14, by allowing the machine to come pre-installed with the Google Play store and the usual array of Google apps. With a new form-factor to explore from a top tier PC maker, it appears that Google has seen a chance to experiment with Android on different form factors; so, how good is Android on a laptop and could it make a dent in the emerging ChromeOS market, which Google and HP are also exploring together? The hardware design on the HP Slatebook 14 is without doubt good. It’s a traditional clam-shell laptop design which HP has made out of plastic, so you’ll find the laptop to be quite light. Even taking into account the keyboard and screen, the Slatebook 14 still manages to measure in at just 1.6cm thin. The plastic is a fairly standard black, but with a pleasant set of bright yellow highlights embedded in parts around the sides and underneath the laptop. The design is somewhat retro, reminiscent of so-called ‘sports’ walkman’s and other electronics from the late 80’s, early 90’s. 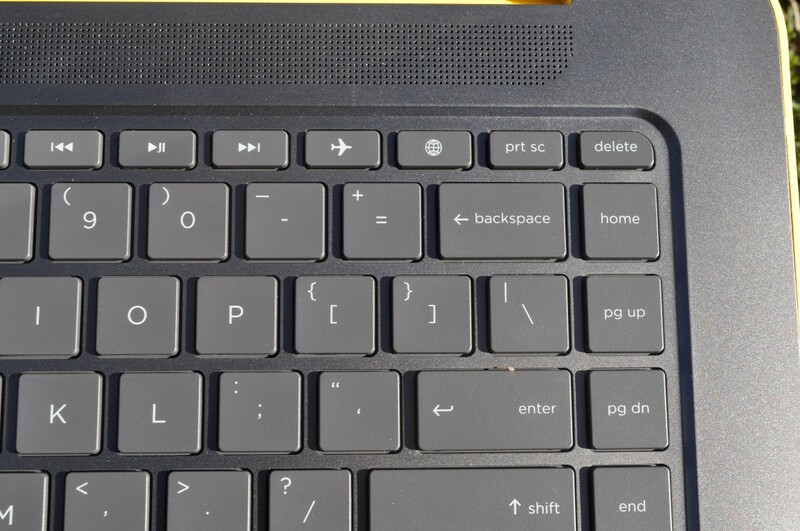 There’s a couple of markings on the Slatebook 14, beginning with the main bright yellow HP logo embedded on the lid. Inside there’s a HP logo beneath the screen, while on the hinge you’ll find the Beats Audio logo. Just below the keyboard is the Slatebook brand, but that’s about it – well except for the usual FCC markings etc on the base. As the name suggests, the Slatebook 14 comes with a 14” screen. The panel is a multi-touch BrightView WLED-backlit panel with a 1920×1080 resolution; with a HP TrueVision HD Webcam mounted above the display. The Slatebook 14 is also a fairly decent powerhouse as well, featuring a processor which HP has used previously on their Slate 21 desktop. It’s running an Nvidia Tegra 4 processor clocked at 1.8 Ghz with 2GB of RAM. As the Beats Audio branding suggests, the Slatebook 14 comes with a great set of speakers, they’re mounted above the keyboard, hidden behind a speaker grille which is simply holes drilled through the main plastic`deck. The Slatebook will be made available in 16GB, 32GB and 64GB storage options – the 64GB version is what we’re reviewing and with Android and the HP apps installed you’re left with 53.94GB of space – but fear not, you’ll find a microSD card slot to allow you to expand that if required. There’s a fairly standard laptop keyboard and trackpad built into the Slatebook 14. On the right hand side of the unit, you’ll find the charging port and 2x USB 2.0 ports, while on the left you get a USB 3.0 port, HDMI out, microSD card slot and dual headphone-out/microphone-in combo jack. HP has done a fine job with the Slatebook 14, with such a thin and light device, you’d expect to have a fairly flimsy unit, but it’s definitely not. There’s little, if any flex in the device, no creaking or anything to make you worried at all when picking it up and moving with it. With years of manufacturing laptops, PCs and other electronics, you can pretty much guarantee that HP have got the manufacturing side of things down. Everything lines up correctly – including the trackpad – which shows what having access to top notch manufacturing facilities can do for you. The hinged lid is nicely mounted, opening and closing with ease. It’s a great overall build. The screen on the Slatebook 14 is decent. We’ve been seeing 1920×1080 FHD resolution displays on Android devices for a while now, but this is at 14-inches, so it’s not the most pixel dense of displays, coming in at 157PPI. Despite all that, it’s a good display, it’s easy to read and looks good while you’re surfing the net, using apps, games or working on documents – essentially anything you want. It’s a fairly bright touch-screen too, with a 270nit brightness. It’s absolutely top notch for using in doors. Sitting outside at a café in the bright glare of the morning sun though, you’ll be better off not bringing the Slatebook – a quick play of Ingress on the Slatebook showed that it’s almost unusable. 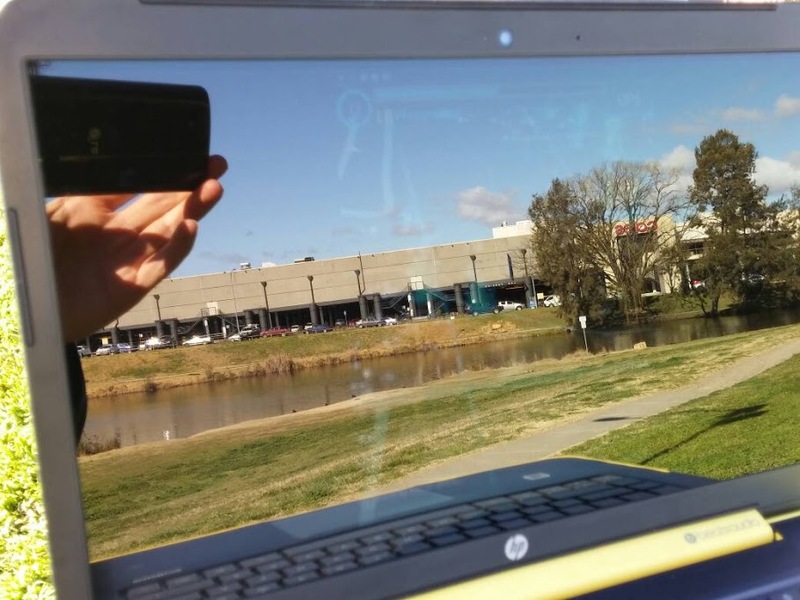 Perhaps a matte screen protector would help, but with the Glossy screen, it was nigh on impossible to see the screen in full sunlight. The screen is touch enabled, if you’re not used to using a touch-screen on a laptop, this will be a new experience, but one that Androids user interface is well suited to guiding you through easily. You’re actually more inclined to touch the screen when required as you’ll find yourself sometimes frustrated with having to use Android with a keyboard and touchpad – but not always. There is a fair amount of bezel at the top of the screen, but it’s surprisingly slim on both sides. HP could afford to lose a cm still at the sides, and at the top but the price-range generally dictates the design and in a sub-$500 laptop, it’s not going to win awards. Bezel is definitely something HP could look at in future models but as it makes the overall laptop a fairly nice size it’s fine. Battery life is really variable on the Slatebook 14, HP promise up to 9 hours of life on the Slatebook 14. It’s somewhere around there depending on what you’re doing, as well as how bright you want the screen. With the screen brightness turned up – it actually dims automatically when you leave it for a minute before turning off to save power – you’ll burn through the battery in around 7-8 hours – using games, video and web surfing. Turn the screen brightness down and you’ll see a bit better life, getting up to the 9 hours promised, although if you really baby it along you can hit above the 9 hours if you want. It’s not terrible actually, with that big 14” screen being thrown through some hard-core gaming (Asphalt 8, Dead Trigger and Riptide GP) as well as video playback – something to think about if you’re after a work horse with some options to kick back and play a game or two at the end of the day. As the first ‘real’ Android laptop, HP are uniquely suited to create it. They have access to large scale facilities that can change keyboard layouts at a whim, something that HP appear to have done with the Slatebook 14. You can see that there has been a fair amount of thought put into the Slatebook 14’s keyboard. There’s specific Multi-tasking and Home keys on the bottom row between the CTRL/ALT keys, you also find a large number of controls on the top row – including a Back key where you normally find the ESC key, a natural inclination is to hit ESC when trying to go back and it works marvelously. Also replacing the normal F1-F12 keys are controls for Search, Volume +/-, Screen Brightness and Voice Search as well as Plane Mode, Web Browser and media playback controls. My Favourite was actually the Print Screen button which takes a screenshot for you. The keyboard is easy to type on, being a fairly standard chiclet keyboard, with good solid key-presses. The only issue I had typing was the Home button being located to the right of the backspace key, something I kept hitting when trying to delete text. With a good Keyboard, So to comes a great touchpad , it’s odd to use Android with a mouse cursor, but you do get over it. You do automatically gravitate towards using the touch-screen initially, but you soon settle into a mix of using the touchpad as well as the touch-screen when necessary. The one nice thing about the Trackpad was gesture support, after years of laptop usage it’s natural to gravitate to a two-finger scroll when reading a webpage or long document. It’s also nice to use a two-finger swipe up from the touchpad to access Google Now. Overall, the HP touchpad is good – it scrolls smoothly with nary a hassle and you’ll barely notice it, really to me the sign of a good touchpad. The Slatebook 14 comes with your usual array of connections Bluetooth, Wifi and microSD card – even GPS, which GPS Test tells me also picked up GLONASS satellites as well. Essentially, it’s got everything you’ll find on your average Android tablet or phone. GPS was slow to lock onto satellites, it’s understandable that GPS performance would be low-end, it’s essentially a laptop after all, but it’s disappointing. They all work well, Bluetooth headsets connect, Wifi networks are easy to find and quick to negotiate a connection with – although it didn’t pick up my 5GHz network and the specs don’t promise Dual-Band Wifi, so it’s something to think about if that’s a deal breaker. There’s a couple of ways to output your display to a TV on the Slatebook 14, with a full sized laptop though, there’s no messing around with MHL or Slimport to get your signal out, on the Slatebook 14 you’ll find a full HDMI port. If you’re wanting something wireless though, switch over to Miracast and you’re off and racing. The Slatebook 14 Miracast settings also include a Game mode BETA to apparently improve streaming performance – there wasn’t a huge difference that I found with it enabled or disabled. With 3x USB ports on the Slatebook 14, connecting USB Keyboards and mice was easy, as was a USB Flash drive, so to do USB Hard Drives show up. It’s little things like this that make the idea of an Android laptop something that could work for media consumers. Sound on Android is hit and miss. With stock Android there’s been little to inspire most musicians or audiophiles, at least until Android L hits later this year. OEMs like HTC, and now HP have used Beats Audio to enhance the default sound. The Slatebook 14 being a HP product gets Beats Audio in terms of hardware – 4 speakers – as well as software tuned by now Apple employee Dr Dre and the team at Beats. The sound is actually quite clear, vocals seem quite clear, but instrumentals sometimes peak out and sound a little distorted, but the vocals are fantastic. Volume-wise, the sound is big, the top-mounted speakers facing you are quite well positioned to give a great sound. With a Tegra 4 processor and 2GB of RAM, the Slatebook 14 whips through Android with ease. There’s very little, if any lag on the homescreen or in the app drawer, app load times are quite fast. Overall, it’s not something you’re really going to worry about, even app switching is quite fast. 3D Gaming was quite good – Riptide GP, Asphalt 8 and Dead Trigger ripped through fine with very little effort. There’s an occasional stagger as the machine loads up the next level or during high intensity scenes – Zombie overload! – but overall, it’s a pretty decent result for the Slatebook 14. Straight out of the box, the Slatebook 14 comes with Android 4.3, it’s a pretty decent start with a number of companies not quite getting to Android 4.4 straight away. HP however, hasn’t exactly been on the ball with their Android updates, so it’s something that you should consider when purchasing a HP Android device. We do hope this will change as HP becomes a more prominent Android OEM. 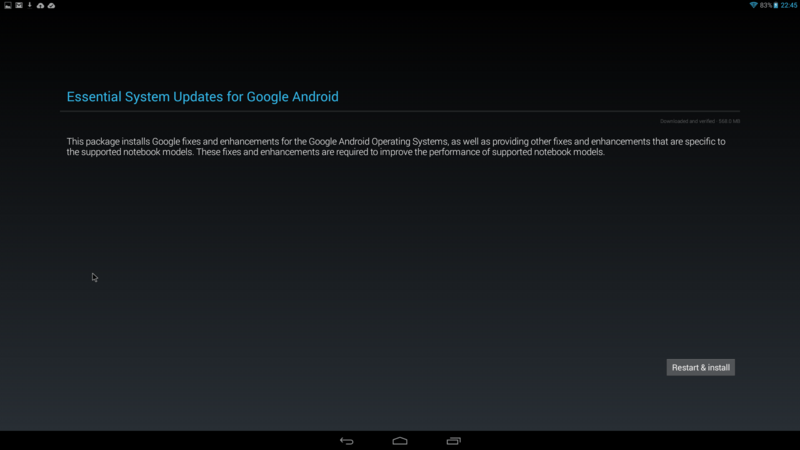 Some small amount of excitement ensued when a a 580MB Android System update presented itself, but after the install, the Android 4.3 version remained the same. Perhaps another time. HP has remained fairly true to the stock Android launcher throughout their introduction and subsequent releases of their various Android devices. It’s something which generally seems to allow them to give a fairly decent operating performance as there’s no extraneous frameworks for Android to include and load in the background. It’s essentially stock Android, and yes, if you want, you can load another launcher – Nova, Apex, Action Launcher or even Google’s much vaunted Now Launcher. There’s a few customisations within the settings menu to include settings for Miracast and Beats Audio – other than that, it’s just plain vanilla Android with a few apps installed. Like all Android devices that come with stock, or fairly stock Android, HP has included a number of bundled apps which are available through Google Play. This of course allows HP or the app owners to update apps easily, without resorting to full system updates. App wise, it’s all pretty good stuff. The apps pre-installed are all fairly heavily oriented towards the business user. From Evernote and Skitch, to cloud storage solution Box. There’s Kingsoft Office to load Office files on the go and you also get Splashtop to remote to your desktop if you need to. To keep you in touch you get Skype – or Hangouts. While the Slatebook appears to be oriented to the business user, there’s also some fun stuff, including Wild Tangent Games service, Video editing software called PowerDirector and of course, this being an Nvidia Tegra powered device: TegraZone. HP too has been slowly building out a raft of Android apps to help with business continuity on the go. A quick search of Google Play will show a large list of HP products, many of which you’ll find installed on the Slatebook 14 – some of which you won’t: HP All-in-one remote, Connected Drive, HP Connected Music, HP Connected Photo (Think Snapfish), HP ePrint, HP File Manager, HP Media Player – and of course, HP would like you to register your laptop, so there’s a registration tool. There’s always a problem beginning work on a brand new form factor. Google has for a while now been using the keyboard as the defining factor as to what devices will, or will not officially run Android. With the Slatebook 14, that paradigm changes. With the combination of touch-screen and keyboard format, Android shows it can indeed scale up to the laptop format. HP has also made moves in this direction with the Slate 21, which in our initial hands-on showed promise. When it comes to competitors in the space, i.e ChromeOS or Windows, you will be able to find cheaper alternatives in the same form factor – at least at the Slatebook 14’s launch price, if that were to drop significantly it would obviously be a different story. When it comes down to it, the reason why ChromeOS wins over Android when it comes to a desktop OS, is that Chrome is a full, not a mobile version. This means all your Chrome extensions are fully accessible and working. With the introduction of Android apps to ChromeOS coming later this year, Google’s ChromeOS is about to get another boost, one that will surely kill the need for an Android laptop. The other place where you immediately find Android on a laptop isn’t a winning formula is gaming. While some apps allow you to remap your controls, very few, if any will allow you to map them to keyboards and trackpads – Asphalt 8 and Dead Trigger I tried and failed to do this. Overall, it’s a nice experiment and I’m 100% sure that HP will sell some Slatebook 14 units, I just don’t think that it’s going to be a product that stands up to repeat models once ChromeOS begins running Android apps. The Slatebook 14 comes at a time when Android is at its peak. It’s the biggest fish in the mobile market and truly has a lot of power and scalability, it works fairly well on a laptop, but there’s better options, and that is where unfortunately the Slatebook 14 isn’t quite there. At $449, HP has a long road to getting the Slatebook competitive with any number of ChromeOS devices on the market, including HP’s own Chromebook 14. It’s essentially a product that has been created after demand by customers, but whether HP has misjudged the amount of customers willing to fork out the money to purchase one is the next question. It’s worth a look though, if Android is really what you want on a laptop – this is the best option out there. So far, you’ll find the Slatebook 14 on-sale for $499 with 32GB of storage on the HP Australia website, but it will be available in 16GB or 32GB versions from Harvey Norman starting at $449. Thanks for writing up the review. I’ve got the HP Slatebook x2 which is similar to this and since the 500 MB software update rollout, it has been performing well. If folks are looking at something like this but don’t like the price, look at the Slatebook x2. A bonus is that the screen can be detached from the keyboard and used as a tablet. That screen glare and reflection is indeed ugly. How does the HP handle portrait only apps? On that top row of function keys, can you define which browser the key opens? Have HP given any clues as to how much they’ll be asking for the 64gb version? Thanks very much for doing the write-up, guys. Screen Glare – Terrible outside, looks lovely inside. Handles portrait apps by positioning them in the centre of the screen. The way the notebook handles portrait only apps, seems to be the HP standard for that stuff, considering that their 21in desktop AIO does the same thing for dealing with portrait only apps. Would have been nice if HP would have let the 64GB model into Australia. What’s the betting that the 64GB model turns out to be the most popular in the markets they do sell it in.